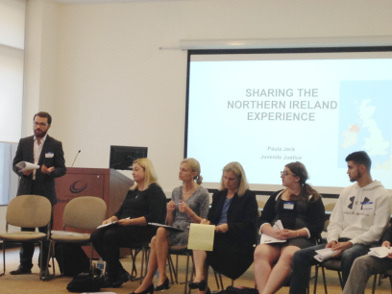 In an event prior to the Second Meeting of the North American Council for Juvenile Justice (NACJJ), the Juvenile Justice Initiative (JJI) and Illinois Balanced and Restorative Justice (IBARJ) held a discussion on November 3 called “Restorative Justice: The Northern Ireland Approach” in Chicago, Illinois, USA. 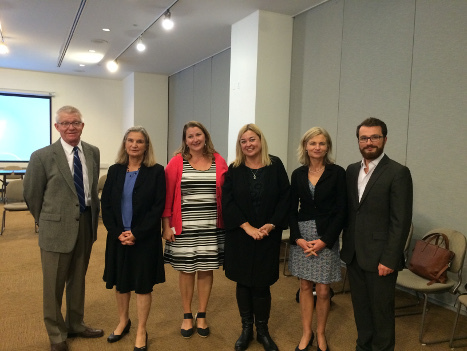 This seminar was a key component of the process undertaken by the JJI, IBARJ and the Illinois Juvenile Justice Commission to review local, national and international restorative justice best practices as a means of submitting recommendations to the Illinois House of Representatives (pursuant to a House Resolution) for implementing restorative justice in the juvenile justice system in Illinois. Northern Ireland was of particular interest because in 2002 The Justice Act was passed, introducing a range of innovative measures for dealing with children who commit offences, including youth conferencing that is based on restorative justice practices. The 4-hour event was attended by approximately 50 people including university students, juvenile justice advocates, academics, law enforcement personnel, public defenders, restorative justice practitioners and many others. Speakers included Cédric Foussard, Director of International Affairs for the International Juvenile Justice Observatory (IJJO), who shared the aims and development of the IJJO and discussed the Second Meeting of the North American Council for Juvenile Justice (NACJJ), to be held later in the week in Toronto -covering restorative juvenile justice in the U.S., Canada and Mexico-, which is co-organized by the IJJO with Elizabeth Clarke, President of the JJI, and Diane Geraghty of the ChildLaw Center at Loyola University. 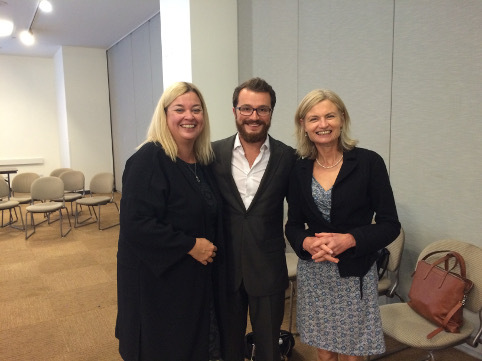 The speakers from Northern Ireland were Paula Jack, former Chief Executive of the Juvenile Justice Agency in Northern Ireland and Yvonne Adair, an independent social worker who worked for the Juvenile Justice Agency for 12 years. Together they provided an overview of the history and implementation of the restorative justice system in Northern Ireland, including the lessons they had learned and recommendations for instituting restorative justice practices such as “bringing along the community”, working with law enforcement and ensuring training and appropriate education is in place for everyone working with young people. Dr. Dee Bell, a nationally recognized activist and expert on restorative justice and evidence-based practices in the U.S., gave the closing presentation by sharing a remarkable story of the extensive use of restorative justice circles as a means of maintaining peace in a community rocked by a racially-motivated act of violence. Many advocates in Illinois, and across the United States, are working to bring a balanced and proportionate approach to the U.S. juvenile justice system. The U.S. is the only country that has not ratified the UN Convention on the Rights of the Child, leaving children subject to harsh practices and sentences such as life in prison without parole, regularly being tried in adult courts and sentences in adult prisons. Sara Balgoyen, Executive Director of IBARJ, noted that there is now a lot of data available from Europe -Northern Ireland particularly- as well as New Zealand, to support a restorative justice system for children in conflict with the law. She would like to see an expansion of restorative justice in Illinois through training and education, as was emphasized by the speakers from Northern Ireland, and generate data and outcomes to support a broader application of the practice.